At Dynamic Catholic, there are three qualities that I always want every team member to have and every team member to be growing in: committed, coachable, and aware. What I want to talk to you about is this third quality of awareness. It’s one of the incredible gifts that God wants to give us and increase in us gradually as we grow spiritually. Most of us have awareness in hindsight. Most of us can look at something that happened last Christmas and say, “Ah, I get it now. When he said that to her and she said that to him, what was really going on was this.” That’s awareness in hindsight. What God wants to give us—it’s an extraordinary gift really—is the gift of present moment awareness. He wants us to be aware of things while they’re actually happening. So right now, you’re experiencing this message. Are you here? Are you thinking about what you have to do today? Are you thinking about something that has already happened today? Or are you here? He wants to give us incredible present moment awareness. He wants us to be aware of things that are happening while they’re actually happening. Three weeks from now, he doesn’t want you to look back on some experience of your granddaughter coming up and giving you a kiss . . . he wants you to be completely absorbed in that moment. He wants you to be aware of it while it’s actually happening. When you walk up to receive Jesus in the Eucharist at church this Sunday, he wants you to be completely aware of what is happening in that moment, while it’s actually happening. He wants you to have life in every breath. He wants you to taste every mouthful of food. And he wants you to taste every drop of water. He wants you to have this astounding awareness. The great enemy of awareness: multitasking. Multitasking, which has been completely, sort of, defunked by scientists as not actually saving us time. We don’t actually accomplish more through multitasking, but we are addicted to multitasking. And multitasking is the great enemy of awareness. 1) When you’re with people, give them 100% of your attention. Whatever you’re doing, give it 100% of your attention, get it done, then move on to the next thing. God wants to give you present-moment awareness. He wants you to be aware of things while they are actually happening. 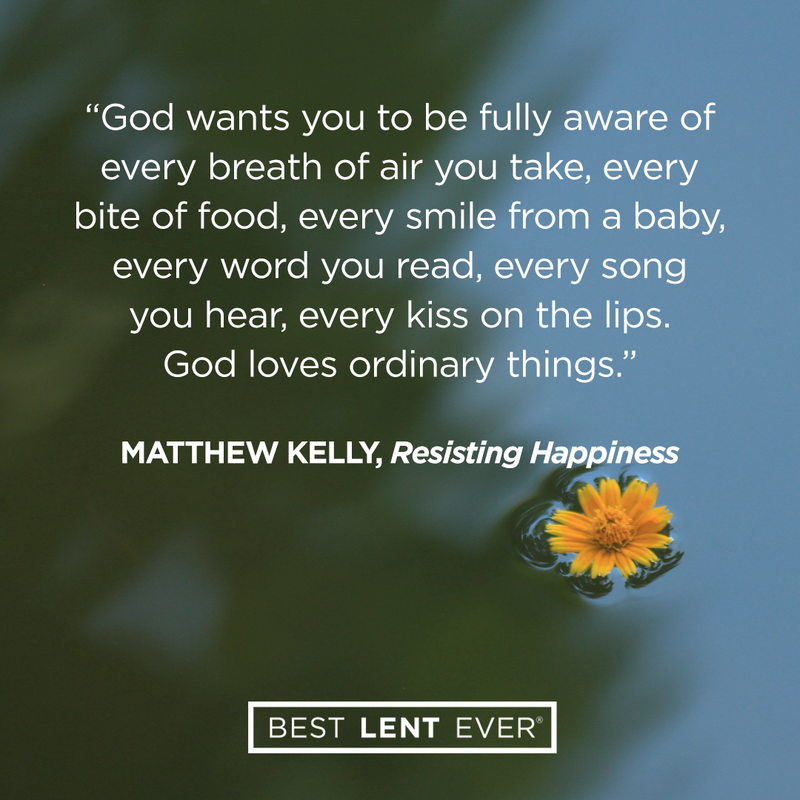 Learn to find God in the ordinary activities of daily life. At the end of the day, write down three times when you were fully aware of God in your day. God, help me to find you in the ordinary; help me to immerse myself in the present moment so I can be with you. Today’s personal reflection features Dynamic Catholic team member Jessica Albers. Jessica is one of our accounting associates. She comes to us from Minster, Ohio, and grew up milking cows on a dairy farm. Jessica’s favorite holiday is April Fool’s Day, and she is planning to run the Boston Marathon on Easter weekend. How do you find God in your daily life?